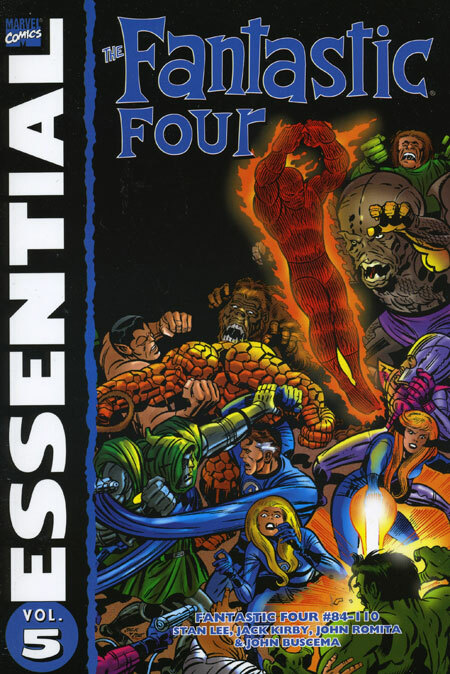 Overview: Have you caught your breath yet from Essential Fantastic Four Vol. 3 yet? Hurry up, because the Lee & Kirby keep volume 4 moving at full speed. Hang on as we continue one of the greatest comic book runs of all time. Let’s start out by going cosmic. The Fantastic Four encounter a mysterious destructive robot known as Sentry 459. We find out later that it was left there by the Kree Empire, led by the Supreme Intelligence and represented by Ronan the Accuser. We later meet the being known only as Him, who later becomes much better known as Adam Warlock. Returning to Earth, we are treated to more adventures with the Inhumans. Crystal starts hanging out with the team more and more, and eventually earns her own blue #4 jumpsuit, as she takes Sue’s place on the team. But why would Sue be leaving the team? 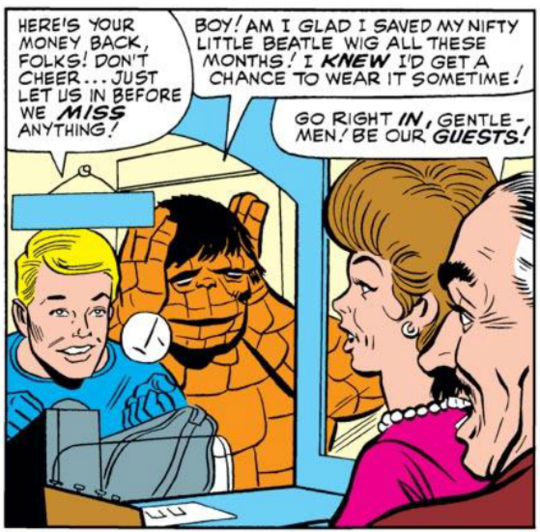 Reed announces to the others in Annual #5 that Sue is pregnant, and she gives birth to Franklin Richards in Annual #6. A host of foes makes their first appearance in this volume. The Psycho-Man shows up, playing on the fears of the team. And if you thought Blastaar was the only bad guy in the Negative Zone, then let me introduce you to Annihulus. Earth is also visited for a second time by the world-devourer Galactus. Good thing the Fantastic Four have the Silver Surfer on their side. The biggest surprise of this book? Not a single appearance by Doctor Doom! Don’t fret, as the good leader of Latveria is the main foe of issue #84, which leads off Essential Fantastic Four Vol. 5. As much as we may miss Doom, there really wasn’t room to fit him into any of these classic stories by Lee & Kirby. Footnotes: Fantastic Four #73 is also reprinted in Essential Daredevil Vol. 2. The Silver Surfer story from Fantastic Four Annual #5 is also reprinted in Essential Silver Surfer Vol. 1. If you like this volume, try: an all-new Fantastic Four team from the early 1990s. Writer Walt Simonson and artist Art Adams were the creative team on the Fantastic Four book, and introduced a new team to take the place of Reed, Sue, Johnny, and Ben. The new team featured Spider-Man, Hulk, Wolverine, and Ghost Rider. It was a fun and popular take on the Fantastic Four concept and the back issues were in high demand at one point. The easiest way to track this story down is by finding the Fantastic Four Visionaries: Walt Simonson Vol. 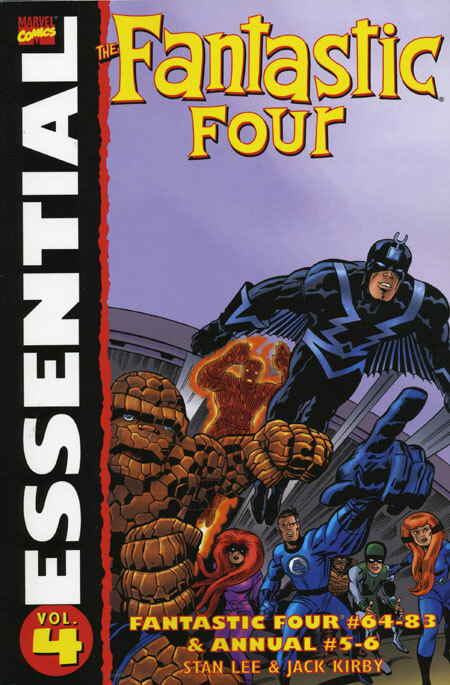 3, which will give you the entire story arc, plus a few more stories featuring Marvel’s first family. Overview: Take a journey into mystery, by following the Rainbow Bridge to the fabled world of Asgard, led by the all-father Odin, and represented by the prince to the throne, Thor, god of thunder and protector of Earth. In the continuation of the Norse god’s adventures, Thor faces off against stronger foes, such as the Grey Gargoyle and the Absorbing Man. Thor is tested to his limits as the Asgardian Destroyer is let loose. Loki’s schemes get more nefarious in his attempts to steal the throne of Asgard away from Odin, only to be thwarted by Thor. The Norse gods cross paths with the Greek gods, as Hercules, Prince of Power, faces off against Thor in a memorable introduction. Hercules and the other Greeks would appear many times in this volume, and the popularity of Hercules would lead to his inclusion in the Avengers title. Finally, the scope of Thor and his book expands as he takes a journey into space, where he encounters one of his greatest challenges to date when Thor faces off against Ego, the Living Planet! Following his return to Earth, Thor meets the High Evolutionary on the peak of Wundagore Mountain, which will be a thorn in the side of many Marvel heroes for years to come. The Tales of Asgard stories continue throughout this volume, giving the reader insights and backstory into many of the supporting characters in the Asgardian mythos. What makes this Essential? 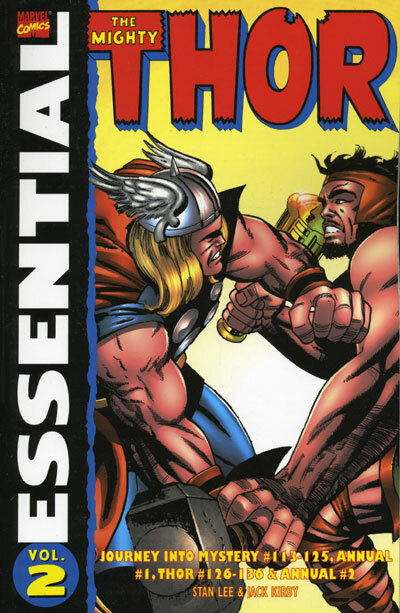 : This is a much better volume of Thor stories than the first volume. While I don’t believe Lee & Kirby hit their creative peak with Thor until volume 3, we see the seeds of grandeur starting to show in the stories. The introduction of Hercules, Zeus, and the Olympian pantheon creates counterparts to the Norse gods and gives Thor a friendly rival to go up against. Add in the introduction of the Warriors Three, the Absorbing Man, and Ego the Living Planet, and this could be considered a better starting point for a new Thor reader. If you like this volume, try: the Incredible Hercules series from 2008-2010. Following the events of the World War Hulk storyline, Hercules took over the Incredible Hulk title, with it being renamed in issue #113. Written by Greg Pak and Fred Van Lente, the story is a humorous look into the adventures of the Greek demigod partnered with Amadeus Cho, a teenage super-genius. Hercules finds himself caught up in awkward situations, usually due to his womanizing ways or by the actions of his rival Ares. These issues have been collected in hardcover and trade paperback collections and should be easy to track down. Overview: Following a freak accident that doused him in radioactive waste, young Matt Murdock finds himself blind but with enhanced senses of hearing, smell, touch, and taste (not often showcased). Matt’s father, the boxer Jack Murdock, pushes his son to study hard so he doesn’t have to follow in his footsteps. When Jack refuses to take a dive in a fight, he is killed by the mob boss that had bet heavily against him. Matt vows to avenge his father, and trains his body to reach it’s peak perfection. Despite his blindness, Murdock dons a costume and takes to the rooftops of New York City as Daredevil, the man without fear! We see that Murdock has become a successful lawyer, sharing a firm with his best friend from college, Foggy Nelson. Add in the adorable secretary Karen Page, who has a crush on Murdock, and our cast is set. Daredevil battles a mix of villains from issue to issue. Some are one-and-done hooded thugs, and some are costumed criminals. We see Daredevil go up against some of Spider-Man’s foes in Electro and the Ox. He even gets his own set of rogues, with introductions of the Owl, Stilt-Man, and the Gladiator. What makes this Essential? : Daredevil is a very unique comic character created by Stan Lee and friends. A blind super-hero goes against everything we imagine a hero should be. Sure, having the enhanced senses helps make it easier for Daredevil to do what he does, but he still remains a blind man swinging between buildings in New York City. 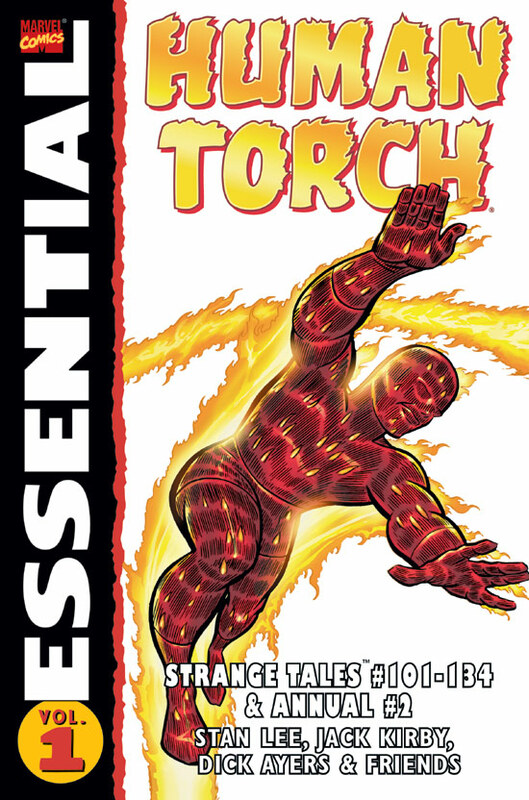 The problem I have with endorsing this as an Essential edition is that there are a dozen different story arcs and runs of Daredevil that are much, much better than the stories in this volume. This is a case where the Silver Age stories do not hold up against the Bronze Age and modern stories. Read this only if you are a Daredevil fan. Footnotes: Daredevil’s original costume was a red-and-yellow garish combination that could only have been designed by a blind man (pun intended!). Beginning in issue #7, Daredevil converted over to his traditional all-red costume. In the issue, Daredevil’s thoughts on the new costume read, “I’ve secretly worked for months to redesign my fighting costume – – to make it more comfortable – – more distinctive!” Yes, very distinctive, and we’ll take Matt’s word on the costume’s comfort. Daredevil #7 is also reprinted in Essential Sub-Mariner Vol. 1. If you like this volume, try: Mark Waid’s ongoing run on Daredevil. Marvel rebooted the series in 2011, bringing in veteran scribe Waid to re-invigorate the character. Waid brought in a fresh take on the characters that harkens back to the early issues of Daredevil from the 1960s. The art team (Paolo Rivera, Marcos Martin, Chris Samnee, and others) have been nailing the art each time out. In this current run, Murdock finds himself barred from serving as a trial lawyer, so he sets up shop as a consulting counselor, advising clients who need to represent themselves in court. This title has won multiple Eisner awards over the three-year run of the book. The entire series is collected in multiple formats (trade paperbacks, hardcovers) so it should not be hard to find. This current run will becoming to an end with issue #36, but will start over again the next month with a new #1, still led by Mark Waid. Overview: Doctor Henry Pym is a research scientist looking to find a way to miniaturize objects. After proving that it works on objects, Pym tries his formula on himself, shrinking down to the size of an ant. Unable to defend himself from the attacking ants looking to defend their home, Pym runs for his life until he can get back to his lab to retrieve the antidote. Putting aside the formula for months, Pym revisits his project as he learns more about the ants. He converts the formula to a gas, attaches the gas canisters to a costume, dubs himself the Ant-Man, and a new hero is born. In the issues to come, Ant-Man develops a decent rogues gallery. While many opponents in these issues were one-and-done, some of his foes such as Egghead, Porcupine, the Human Top (later renamed Whirlwind), and the first Black Knight would have long-lasting spots in the Marvel Universe. In Tales to Astonish #44, we meet Janet Van Dyne, the daughter of a fellow scientist. When Janet’s father is murdered, she seeks help from Pym. Donning his costumed identity, Ant-Man rescues Janet and reveals his identity to her. Pym uses his current research to mutate Janet’s body, giving her the ability to shrink down to insect size while wings sprout from her back. Taking on the name of the Wasp, the duo avenges the murder of Janet’s father, and a new partnership is formed. Shortly after joining the Avengers, Pym feels inadequate in comparison to his other teammates in Thor, Iron Man, and the Hulk. 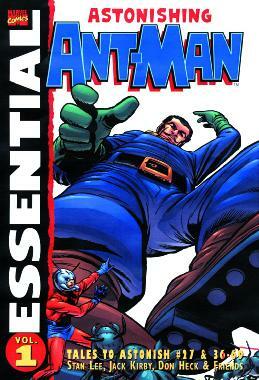 Pym theorizes that what can be shrunk can also be enlarged, and Giant-Man is born. This is the first of many costume identity changes that Pym will make over his career. What makes this Essential? : There are very few original ideas in comics. Everything is inspired by what has come before, or as an unapologetic attempt to duplicate success at a rival publisher. DC had found success by resurrecting the Atom identity with Ray Palmer in Showcase #34 (September/October 1961). Henry Pym first appeared in January 1962 and dons the Ant-Man costume and identity in September 1962. Over at DC, the Atom joined the Justice League in Justice League of America #14 (September 1962), and Pym (with Van Dyne and others) found the Avengers in November 1963. So whether Lee & Kirby were directly trying to duplicate DC’s success, or just wanting to have their own size-changing hero, the timeline that Henry Pym follows seems to mirror that of Ray Palmer, just one year behind. Despite being founding members, Ant-Man and the Wasp often get pushed to the side in modern retellings of the early days of the Avengers. These stories help justify their place on that team. Pym is a brilliant scientist who gets overshadowed in other comics by his contemporaries in the Marvel Universe. The Wasp was not a sidekick, but a truly equal partner with Ant-Man. She earned her own ongoing backup feature, which may have been the first female-led super-hero stories at Marvel. Lee and Kirby do the bulk of the stories in this volume, but they get overlooked by all of the other legendary stories that were coming out in this era. This volume is worth taking a look! Footnotes: Henry Pym was just one of the tenants in Tales to Astonish during the 1960s. Initially, the book was a science-fiction anthology title. When the super-hero movement took off, Pym became the lead feature each month with various backup stories. Starting in issue #50, the Wasp was given her own solo story feature, giving the book two super-hero stories per issue going forward. With #60, the Wasp feature ended and her space was given their former Avenger colleague, the Hulk. In 1965, the Giant-Man feature was replaced by Namor, the Sub-Mariner, beginning in #70. If you like this volume, try: the Mighty Avengers: Earth’s Mightiest collection, available as both a hard cover or a trade paperback. Following the events of Secret Invasion, Henry Pym has once again adopted a new costumed identity, this time as the Wasp. Pym’s ex-wife was believed to have sacrificed her life in stopping the Skrull invasion of Earth, and Pym wants to honor her memory by keeping the Wasp name alive. A new Avengers team is formed, by what appears to be the long missing Scarlet Witch. Can this new team of Avengers come together to help save the Earth? This is one of the best story lines involving Henry Pym and the Avengers. Pym is confident in his abilities, he steps up as a leader of gods and warriors, and he proves that his intellect is just as great as Reed Richards and Tony Stark. Over the last 10 years, this was the one Avengers title that felt most like the Avengers of the 1960s, 1970s, and 1980s. Overview: Captain America bounces back in this second Essential volume from Marvel. We see the transition of the character in this book, as Lee & Kirby take their final run together with Steve Rogers, before handing him over to next wave of creators in the Marvel Bullpen. While these stories feature a healthy dose of classic villains like the Red Skull and Batroc the Leaper, new villains are added to the mix that expands Cap’s rogues gallery. First up is Doctor Faustus, who uses drugs and mind-control techniques to fight Captain America in psychological battles. The other addition is Madame Hydra, the new leader of the criminal Hydra organization. Complete with her Hydra-green lipstick, Madame Hydra (later known as the Viper) becomes the female antagonist that can tempt Steve Rogers with her body, or lead Hydra in an attempt to take over the world. Rick Jones tries donning the Bucky costume and serves as Cap’s partner for a few issues. While it does not work for either one, it does show that Cap excels with a partner. Enter Sam Wilson, Harlem social worker and the high-flying Falcon. Captain America and Falcon would partner for many years going forth, and their strong friendship continues to this day. What makes this Essential? 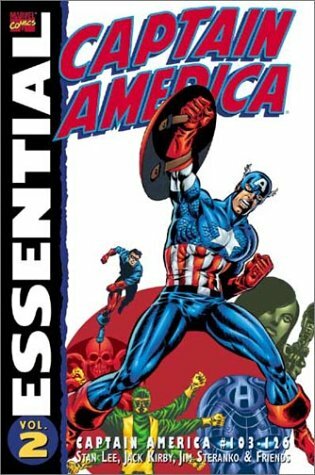 : Captain America starts to expand as a character in this volume, as new creators move in to take over for Lee and Kirby. While Steve Rogers still pines for the world he left behind, he starts to accept living in the (then) modern world of the late-1960s. The creative teams start realizing the possibilities of the character, whether serving as an agent for the government or S.H.I.E.L.D., or as the leader of the Avengers. The creative art advances by Steranko and Colan make this a worthwhile edition to pick up. Footnotes: While the Black Panther is considered to be the first black superhero, he is a prince from the African nation of Wakanda. The Falcon, who debuts in this Essential, is considered to be the first African-American superhero, created by Lee and Colan. If you like this volume, try: the Jim Steranko run on Nick Fury, which ran in Strange Tales and in the early issues of Nick Fury, Agent of S.H.I.E.L.D. These stories have been collected numerous times (but not in an Essential) so it should not be difficult to track these down. Steranko came in and took over the art duties from Kirby, and then the writing duties from Roy Thomas. Steranko’s run was part James Bond, part Andy Warhol’s pop art, and pushed the limits of the Comics Code Authority numerous times. Our perception of what S.H.I.E.L.D. should be came from these issues. Truthfully, this is a story better read in color, so pick it up any way you can.